I try to steer clear of political opinion on the blog, but irrespective of where you stand on the issues or candidates, one thing I feel strongly about is voting. Colorado is a great place to live and contribute. Understanding the issues and voting accordingly will keep it that way. 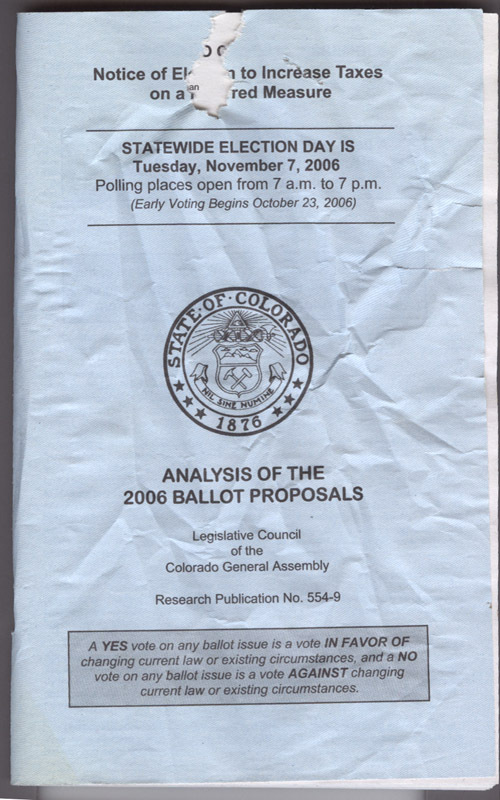 If you're planning to vote, be sure to read Colorado's Blue Book for 2006 (PDF). The Blue Book includes a list of arguements for and against a specific proposal and an analysis of financial impact. There's even an audio version. 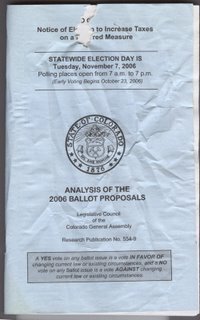 Another resource to check out is the Daily Camera's Voter Guide 2006. It includes profiles of candidates and details about local ballot issues. p.s. Lafayette is voting on growth issues. Broomfield has an open space issue. We're in store for a really fun election day, regardless of what the outcome. (Of course, it would be way more fun in the outcome was something in particular, but nonetheless...) Can you remember the last time this many races were in a dead heat? I'm excited.